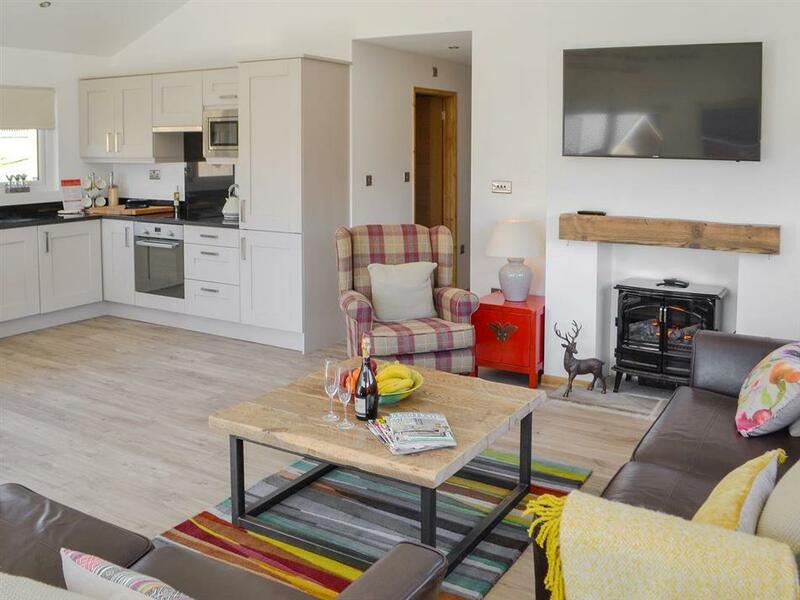 Daffodil Lodge in Otterburn, near Bellingham, Northumberland sleeps 6 people. 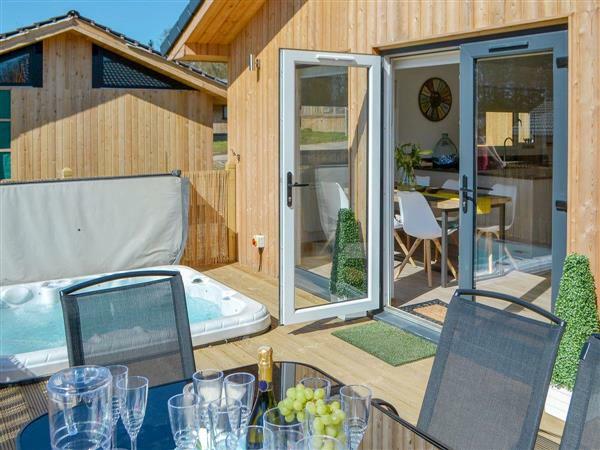 Daffodil Lodge near Bellingham was built in 2018; Daffodil Lodge boasts its own private hot tub for 6 set on a sunny, south-facing decked veranda, and has TVs in all the rooms making a perfect base for holidays or visiting the two large wedding venues nearby in Otterburn. Furnished to a good standard with a homely and welcoming feel, Daffodil Lodge is set amongst other lodges on this holiday park, just on the outskirts of the Northumberland National Park. With the quirky poems on some of the walls reflecting on Wordsworth’s poem, the lodge is light, airy and welcoming. The long wooded drive up to the park sets the scene for your break away from the hustle and bustle of everyday life. This is a perfect base for couples or families to explore the Northumberland National Park, Kielder Forest and observatory and the Borders. Situated 16 miles from the Border Counties, outdoor enthusiasts will love this location which is a favourite with walkers and adventure seekers. Bellingham, 9½ miles away, has a choice of tea rooms, pubs and village shops, while a day trip to Alnwick, with its famous castle and the Northumberland Heritage Coast peppered with castles and beaches, makes a fine day out and is approximately an hour’s drive from Daffodil Lodge. Hadrian’s Wall is only a few miles with Roman forts and museums along the way, a reminder of the Roman times and the rich history of Northumberland. Hexham and Rothbury are easily accessible with plenty of pubs and shops. This is a beautiful spot for exploring the whole of this friendly and unspoilt county. The restaurant and bar is only 300 yards away and an award-winning wedding venue, is less than 1 mile away. The village shop has a good selection of necessities with a selection of wines, or you can organise a large supermarket delivery if you want to be even better prepared. The shop is 1 mile from Daffodil Lodge near Bellingham, with the pub and restaurant 300 yards from Daffodil Lodge. Living area: With electric wood burner, 50’’ Freeview Smart TV and French doors leading to decking. Bedroom 1: With double bed, 32’’ Freeview TV and en-suite with double walk-in shower, toilet and heated towel rail. Bedroom 2: With double bed and 40’’ Freeview TV. Bedroom 3: With twin beds and 40’’ Freeview TV. Electric central heating, electricity, bed linen and towels included. Travel cot and highchair. Decked area with garden furniture. Hot tub for 6 (private). Private parking for 2 cars. No smoking. Please note: The property has a natural water supply from a spring. Holidays at Daffodil Lodge run from Friday to Friday. Pets allowed at Daffodil Lodge. For a better idea of where Daffodil Lodge is, you can see Daffodil Lodge on the map below. Daffodil Lodge is in Northumberland; should you be on the lookout for a special offer, you can find all the special offers in Northumberland. It's always worth checking to see what is on offer at the moment. Do you want to holiday near Daffodil Lodge (UKC3316), you can see other cottages within 25 miles of Daffodil Lodge; have a look to find your perfect holiday location.